TimeZone : Public Forum » New Hamilton, as well. "All Black" review. Thanks to all who shared their thoughts on how I might fulfill my desire for a good GMT auto for use while traveling. Suffice it to say, this does it for me. 42mm case (wears big due to large crown size and big lugs), 22mm lug width, readily visible GMT hand and second crown actuated world time bezel. Crystal display back for the standard ETA GMT module pimped out with a Hammy rotor. 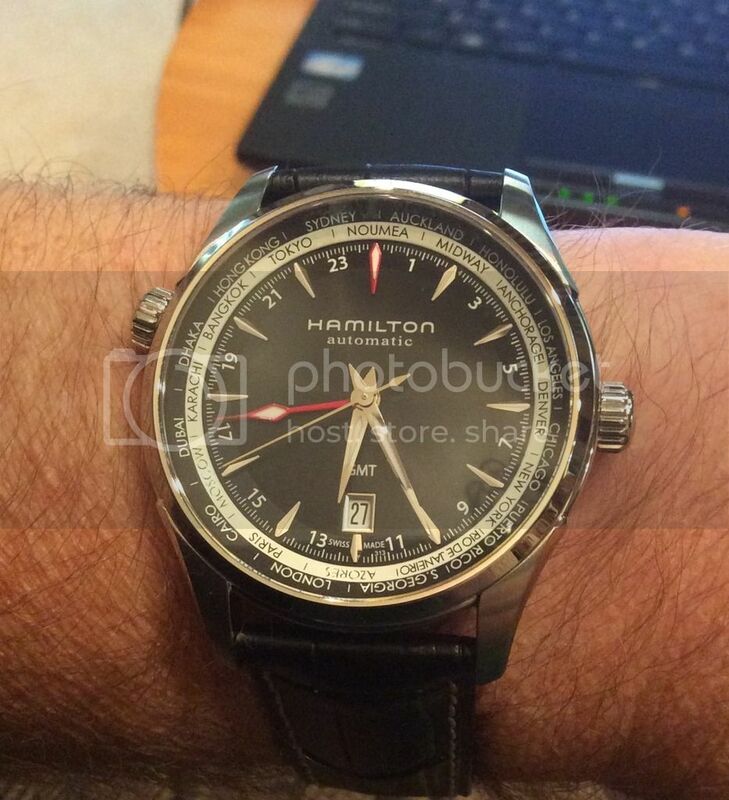 Very nice dual release deployant clasp with Hamilton logo on black leather faux croc band. The red GMT diamond pointer really pops on the glossy black dial. The price/value was right, as well. Several high dollar GMTs use the same movement. Only two complaints - the location of the screw down bezel crown. It's hard to use, being on the left, w/o taking the watch off. The lume is a bit weak after an hour in the dark. It was between this and the Mido Multifort World Traveller. The Geneva striped dial didn't do it for me. It might have, if the dial was a plain white and creamy enamel dial.